The Appleton (Wisconsin) Post Crescentpublished the only known photograph of the Iron Man Game. 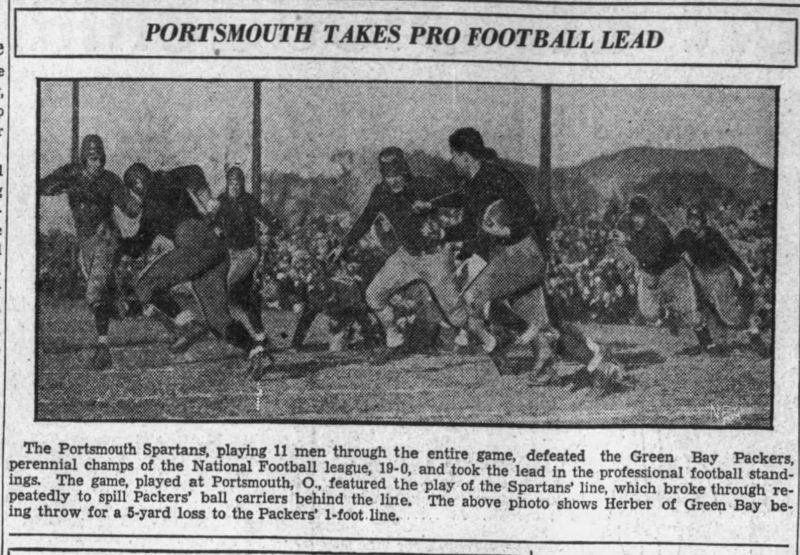 With the headline, "Portsmouth Takes Pro Football Lead," the caption states "The Portsmouth Spartans playing 11 men through the entire game, defeated the Green Bay Packers, perennial champs of the National Football League, 19-0, and took the lead in the professional football standings. The game, played at Portsmouth, OH, featured the play of the Spartan's line, which broke through repeatedly to spill Packer's ball carriers behind the line. The above photo shows Herber of Green Bay throw a 5-yard loss to the Packers 1 foot line."